Bharath Shankar was named the Man of the Match. Ruby Trichy Warriors beat VB Kanchi Veerans by six wickets in their concluding league fixture for their fourth win in the 2018 Sankar Cement-TNPL at the ICL Sankar Nagar ground in Tirunelveli on Sunday, Aug 5 but it was not sufficient to clinch a spot in the Playoffs. 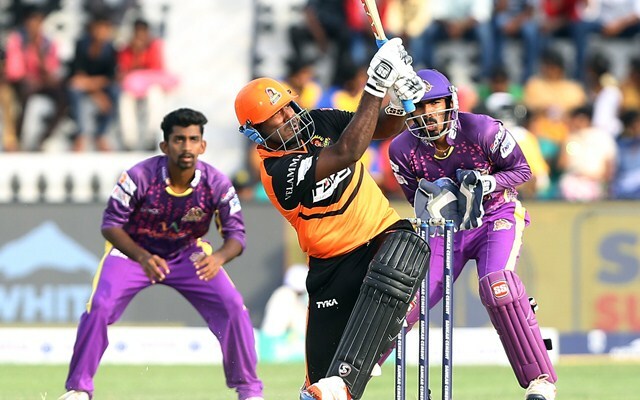 In order to overtake Lyca Kovai Kings, who are currently at the fourth spot, Trichy Warriors required to achieve the target of 137 in just 7.5 overs. Kanchi Veerans, who gave opportunities to their entire 19-member squad, suffered their sixth defeat in seven matches to finish seventh in the eight-team competition. Chepauk Super Gillies brought up the rear. Opting to bat first, Kanchi Veerans were reduced to 46/3 in 6.2 overs. Francis Rokins lifted the side to 136/8 with an unbeaten 43. Trichy Warriors’ captain Baba Indrajith employed as many as seven bowlers. Off-spinner Suresh Kumar conceded only 14 runs in his four overs while left-arm spinner K Vignesh and medium-pacer Sonu Yadav took two wickets each. For Trichy Warriors opener Bharath Shankar hit a fine 69 and Indrajith chipped in with 26. VB Kanchi Veerans 136/8 in 20 overs (Francis Rokins n.o. 43, U Vishal 25, K Vignesh 2-25, Sonu Yadav 2-26) lost to Ruby Trichy Warriors 139/4 in 17.4 overs (Bharath Shankar 69, Baba Indrajith 26, C Shriram 2-20, Aushik Srinivas 2-30).